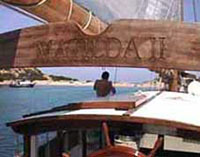 The schooner Matilda II was launched in Cagliari in 1999. All features of the boat, shape of the hull and rig, are based on the type used by North American sailors in the nineteenth century, renowned for its speed and easy handling. 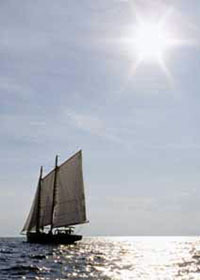 The hull is made of steel and the masts and all deck finishings are wooden. 220 square meters of sails allows Matilda II to reach speeds of 9-10 knots in the stiff breezes often found in the Gulf of Cagliari. Under the deck, Matilda II is comfortable and quiet thanks to watertight bulkheds that separate the living quarters from the engine room. 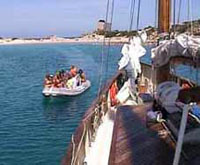 Customers can have access to all areas of the boat, from the cockpit on the stern to the main saloon. We also have bathroom facilities available complete with handbasins and W.C. On deck, shade is provided by movable covers which can be used for shelter in the unlikely event of rain. Only the anchoring mechanism is automised, all other manouvres come about through a combination of elbow grease and enthusiasm. Customers are naturally excused from any deck duties. We really hope that all these authentic features add that something extra to your trip with us. What happens if there isn't any wind? Matilda II is equipped with a large diesel engine, used for docking manouvres and in the event of any adverse weather conditions.